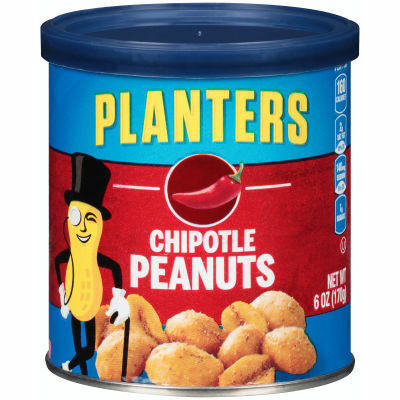 Planters Chipotle Peanuts - Planters Chipotle Peanuts are made with a hot, peppery chipotle seasoning that adds serious heat to this eclectic peanut snack. Other ingredients including garlic, dried onion, dried tomato, and a pinch of sea salt take that heat to a whole new level of flavor. This crunchy snack is perfect for your between-meal cravings. - The Perfect Combination of Spicy and Crunchy - When you're looking for more energy or something to tame your cravings for crunch, these chipotle peanuts are the perfect snack.